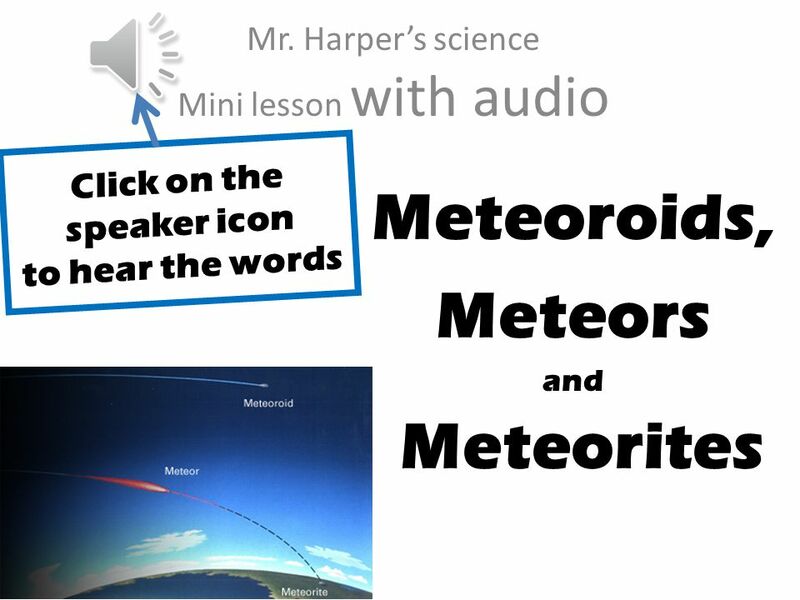 J Meteoroids, Meteors and Meteorites Mr. Harper’s science Mini lesson with audio Click on the speaker icon to hear the words. 4 Long, long ago there was a great spinning cloud of hydrogen gas in space. 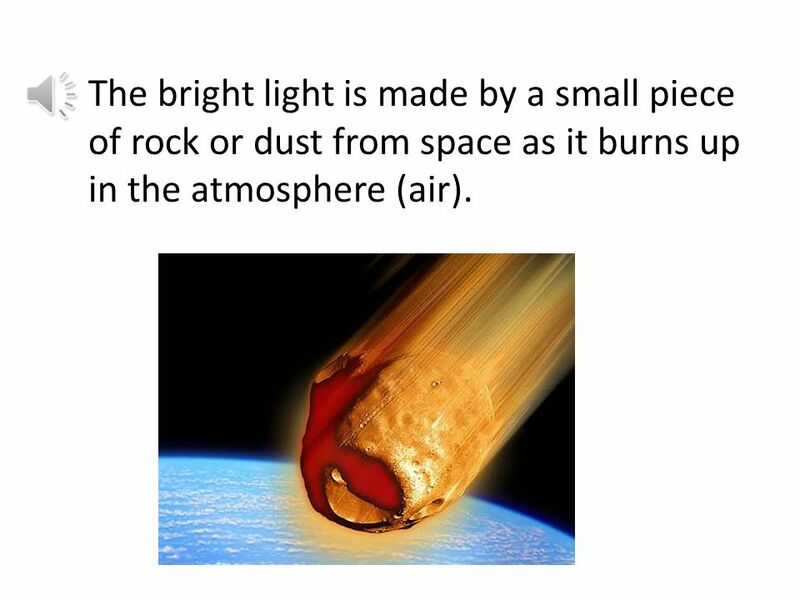 j The bright light is made by a small piece of rock or dust from space as it burns up in the atmosphere (air). 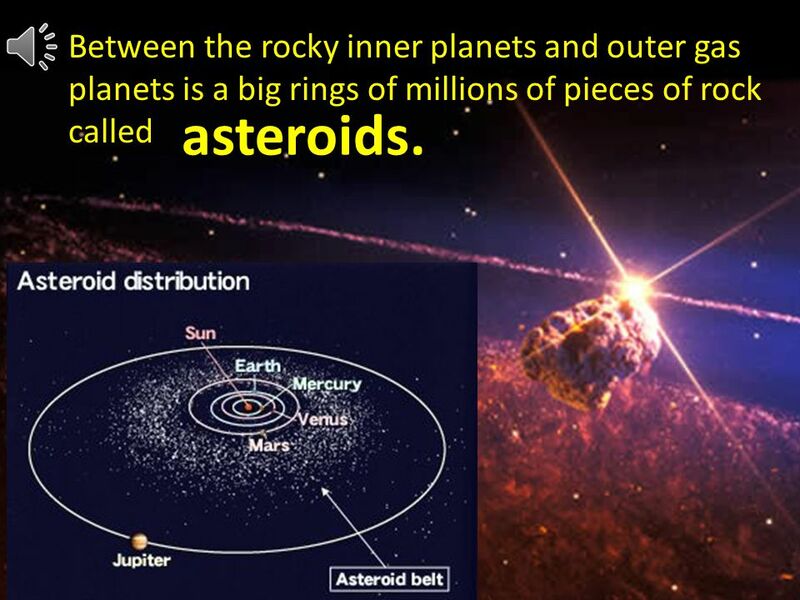 5 J Between the rocky inner planets and outer gas planets is a big rings of millions of pieces of rock called asteroids. 6 Long, long ago there was a great spinning cloud of hydrogen gas in space. j Asteroids that bump together can throw pieces of rock out of orbit from the asteroid belt. These meteoroids drift through space until the gravity of a large object like a planet or the sun pulls them in. Most of the bigger meteoroids are pieces of asteroids. 7 Long, long ago there was a great spinning cloud of hydrogen gas in space. 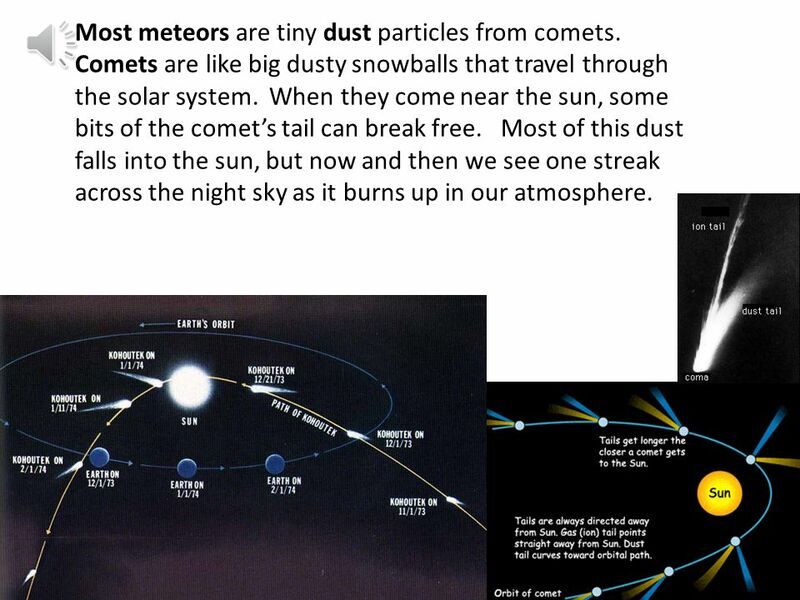 j Most meteors are tiny dust particles from comets. Comets are like big dusty snowballs that travel through the solar system. When they come near the sun, some bits of the comet’s tail can break free. Most of this dust falls into the sun, but now and then we see one streak across the night sky as it burns up in our atmosphere. 8 But what makes a meteor burn up like that? 9 Long, long ago there was a great spinning cloud of hydrogen gas in space. j Earth is surrounded by a blanket of tiny gas molecules (atmosphere). Earth air isn’t very heavy but it does have mass (weight). 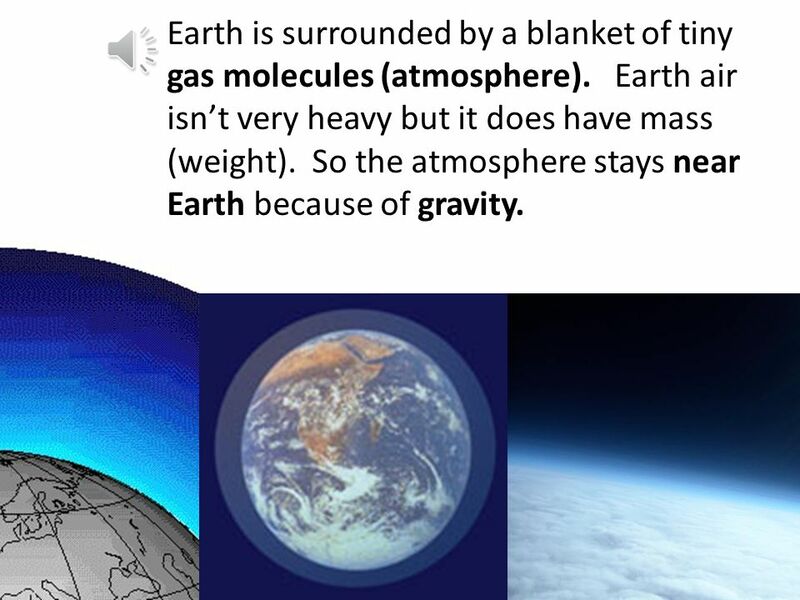 So the atmosphere stays near Earth because of gravity. 10 Air doesn’t get in our way unless we try to go through it at high speeds. 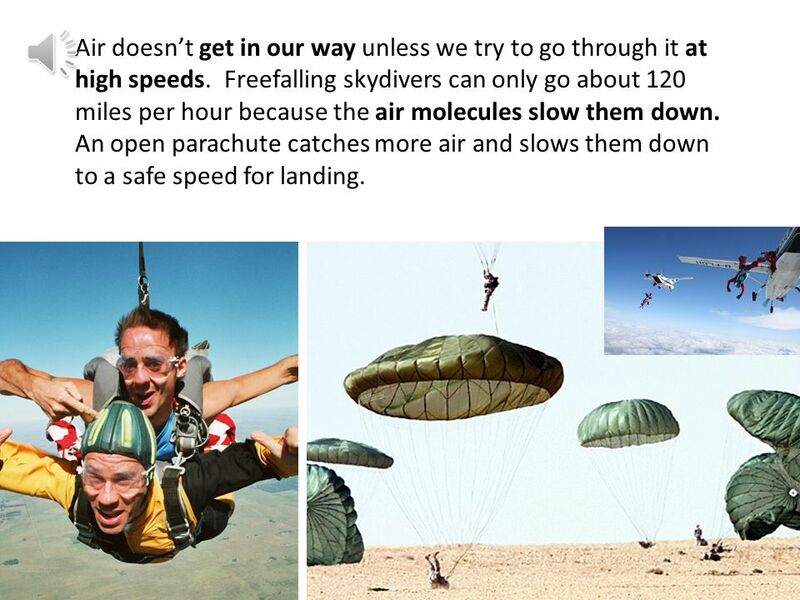 Freefalling skydivers can only go about 120 miles per hour because the air molecules slow them down. An open parachute catches more air and slows them down to a safe speed for landing. 12 Long, long ago there was a great spinning cloud of hydrogen gas in space. 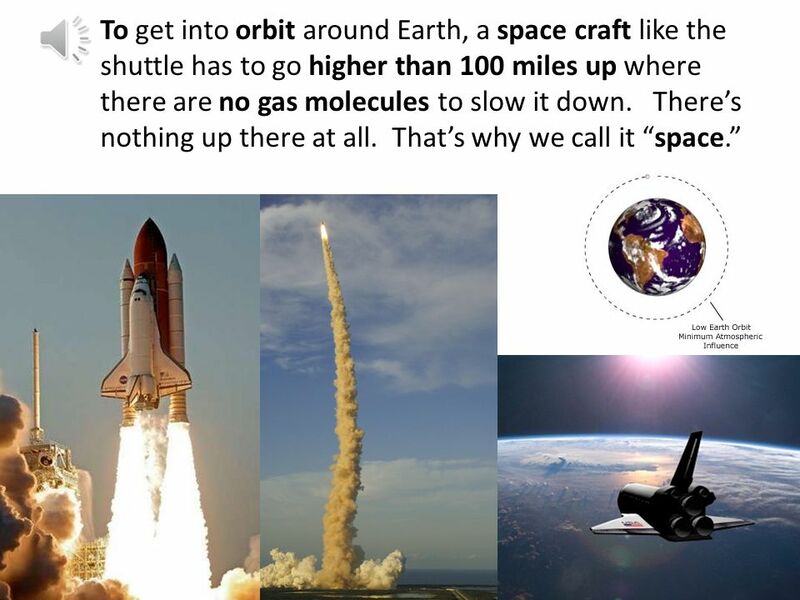 j 17,500 miles per hour is the speed necessary for a spacecraft to stay in orbit. 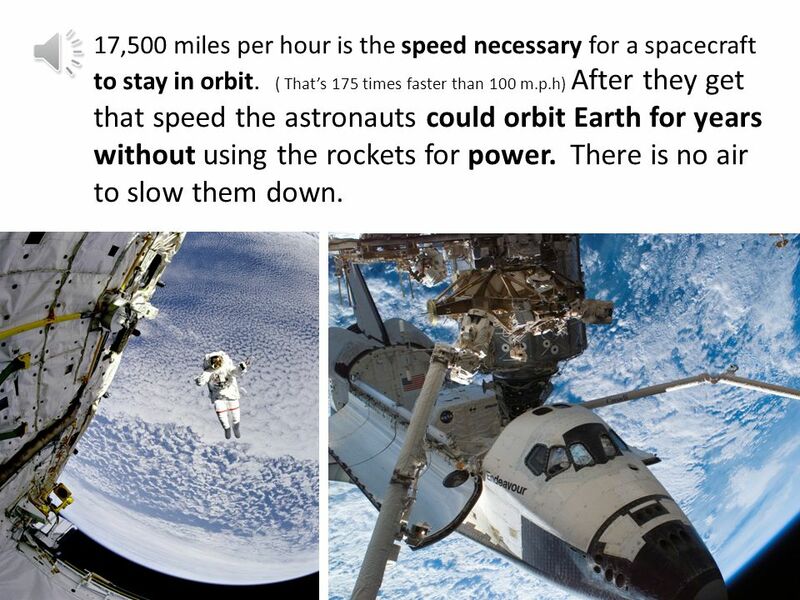 ( That’s 175 times faster than 100 m.p.h) After they get that speed the astronauts could orbit Earth for years without using the rockets for power. There is no air to slow them down. 13 Long, long ago there was a great spinning cloud of hydrogen gas in space. j When astronauts want to come back home, they slow down the craft. This makes them fall toward Earth, but they are still going really fast. As they get lower into the atmosphere the air molecules start rubbing against the space craft. 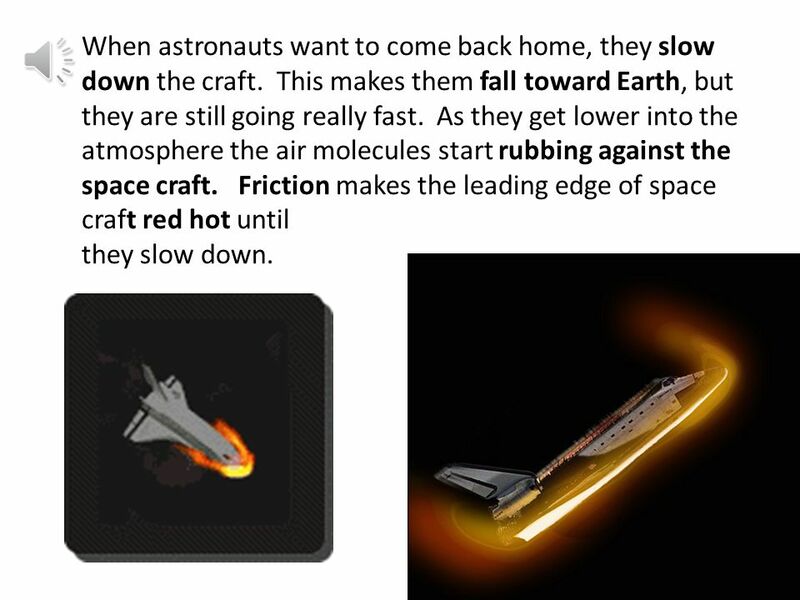 Friction makes the leading edge of space craft red hot until they slow down. 14 Long, long ago there was a great spinning cloud of hydrogen gas in space. j Rock and dust meteoroids way out in space have no air molecules to slow them down as they fall faster and faster toward Earth. Then they get near Earth where they get hot from friction (rubbing against the air so fast). 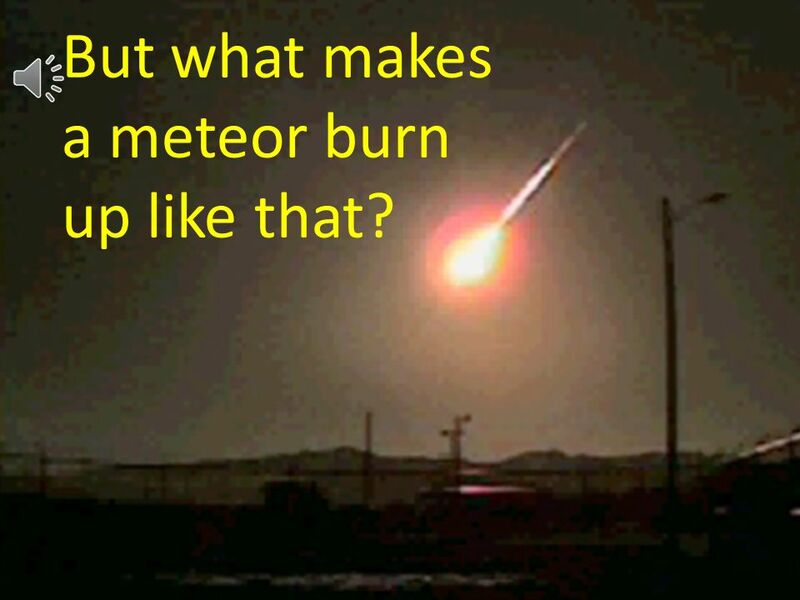 Most meteors burn up completely before they can get to the ground. 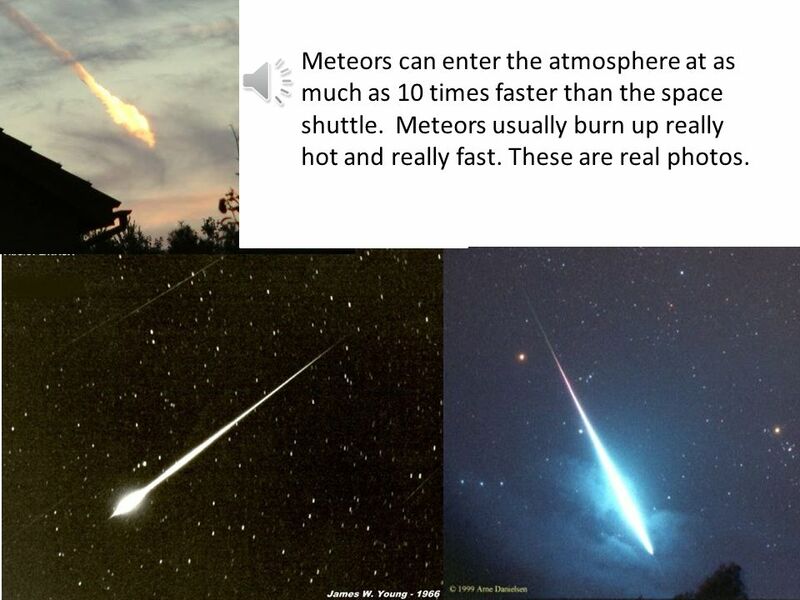 15 J Meteors can enter the atmosphere at as much as 10 times faster than the space shuttle. 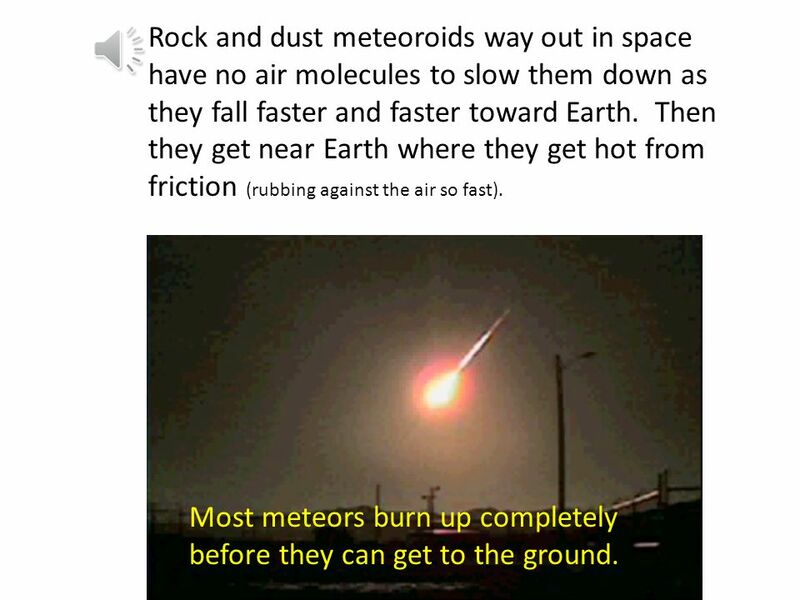 Meteors usually burn up really hot and really fast. These are real photos. 16 J Most “shooting stars” are smaller than a grain of sand. 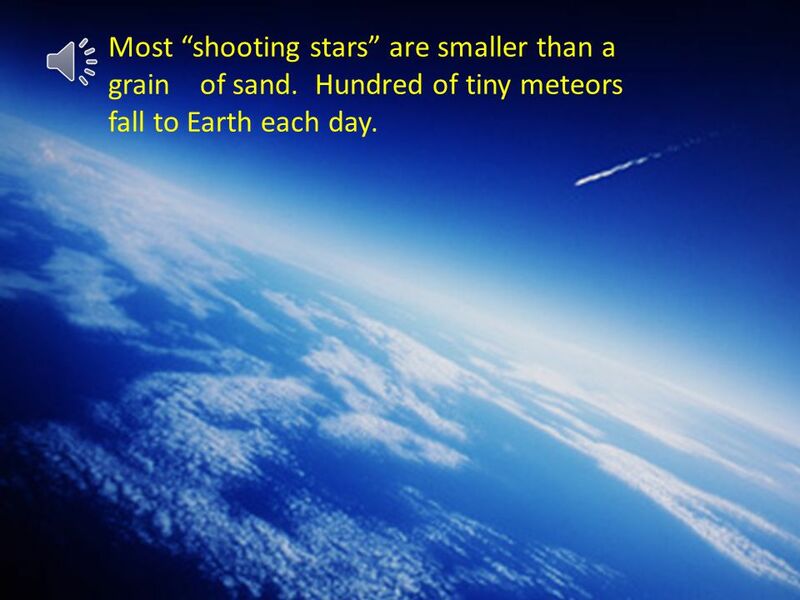 Hundred of tiny meteors fall to Earth each day. 17 But now and then we get a meteor big enough to make it through the atmosphere and hit the ground. 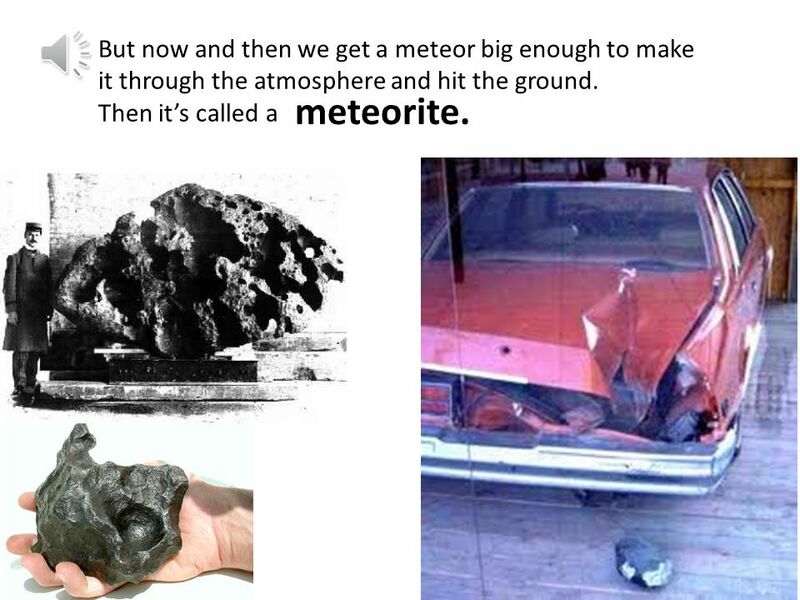 Then it’s called a meteorite. 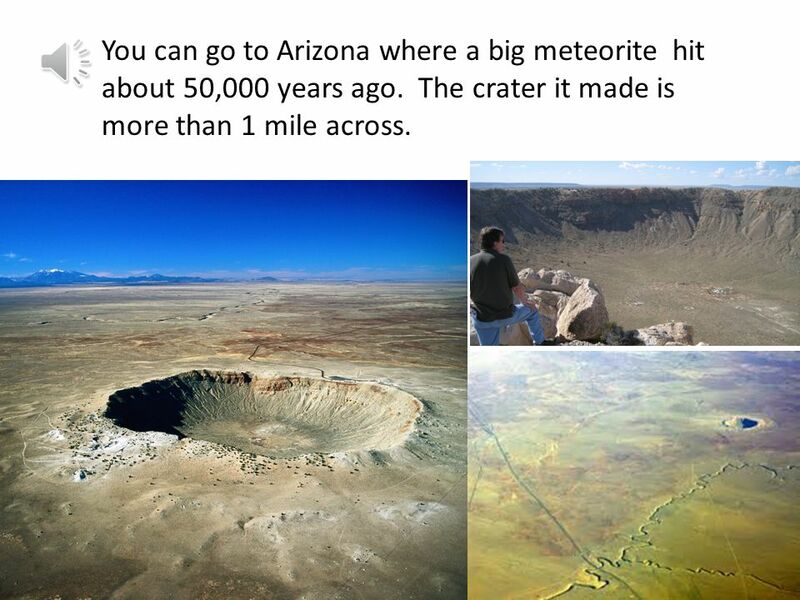 18 J j You can go to Arizona where a big meteorite hit about 50,000 years ago. The crater it made is more than 1 mile across. 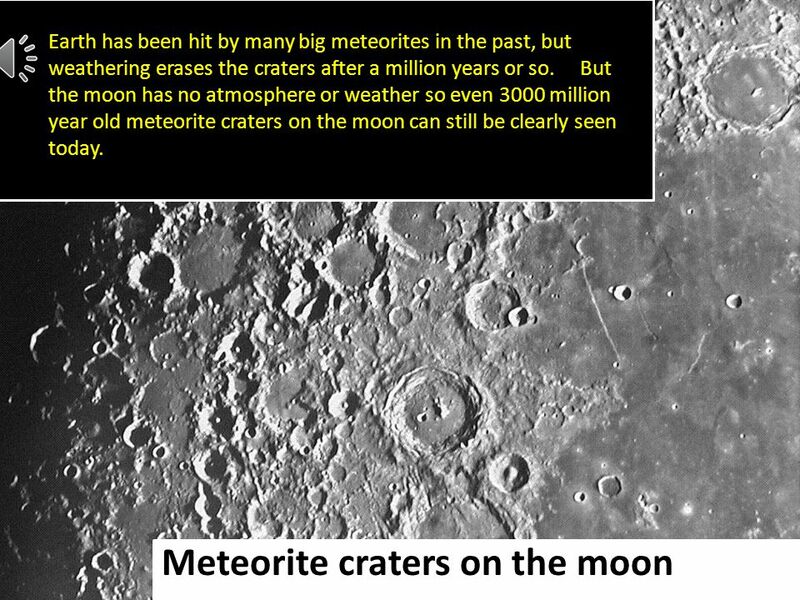 20 Because there is no atmosphere, meteors don’t burn up when they get near the moon. 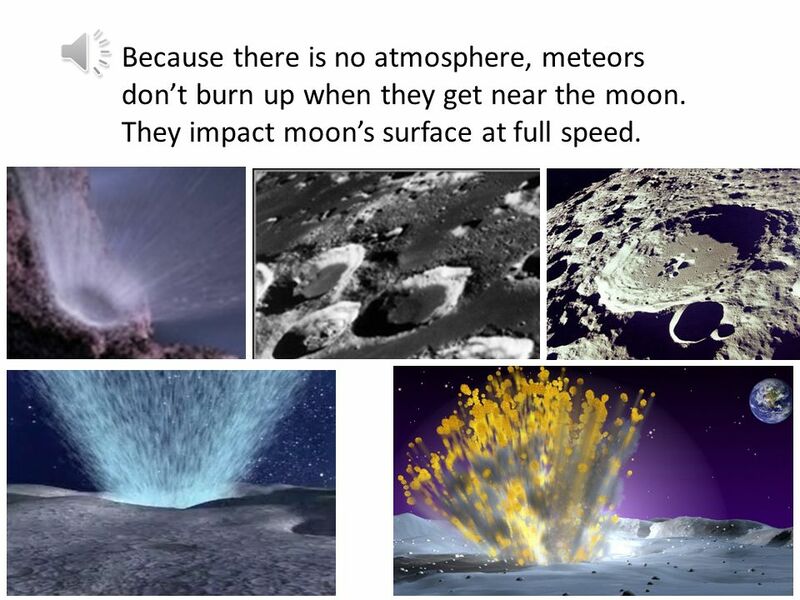 They impact moon’s surface at full speed. 21 J Once in a great while a REALLY big meteorite hits Earth. Scientists believe that a meteorite hit the ocean near Mexico about 65 million years ago. 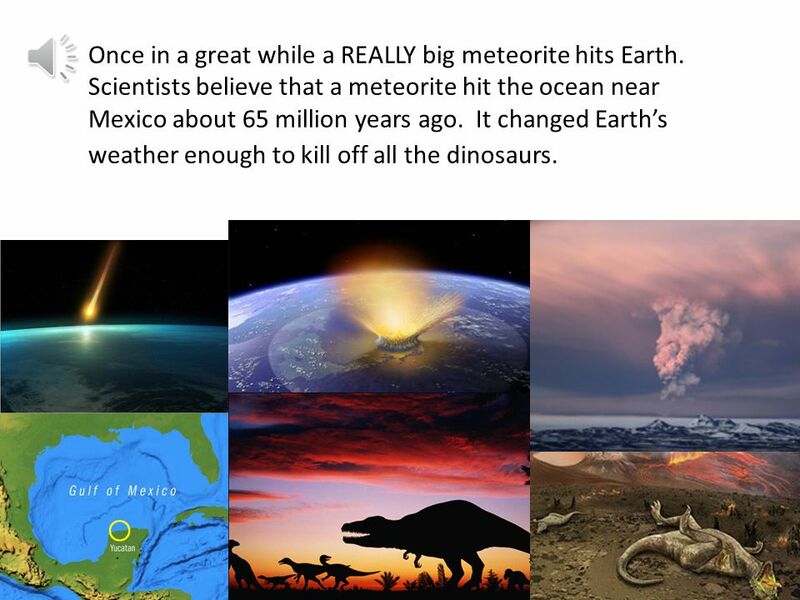 It changed Earth’s weather enough to kill off all the dinosaurs. 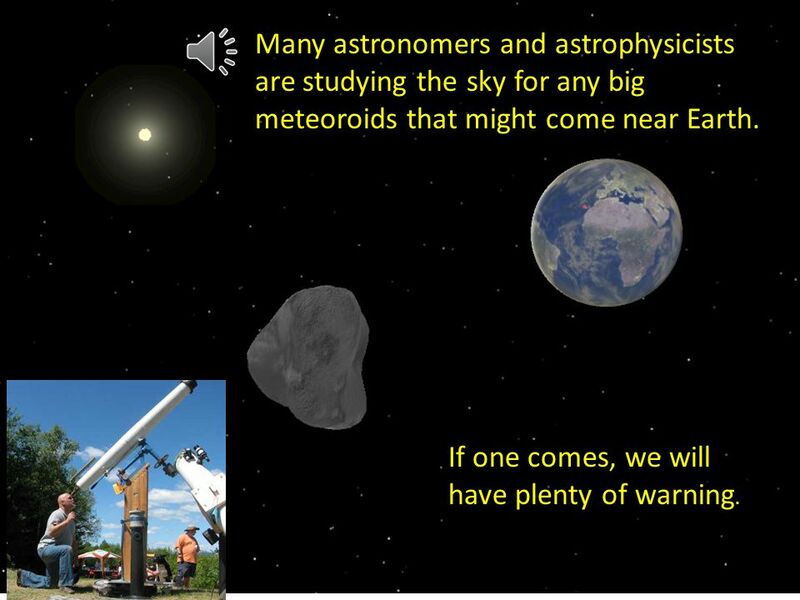 22 Many astronomers and astrophysicists are studying the sky for any big meteoroids that might come near Earth. If one comes, we will have plenty of warning. 23 So…a rock in space is called a meteoroid. 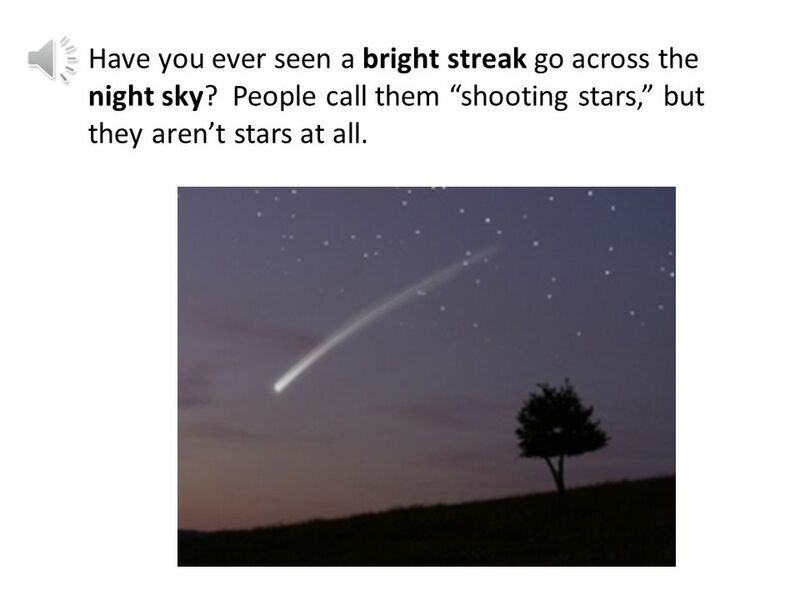 If it comes into Earth’s atmosphere it’s called a meteor. 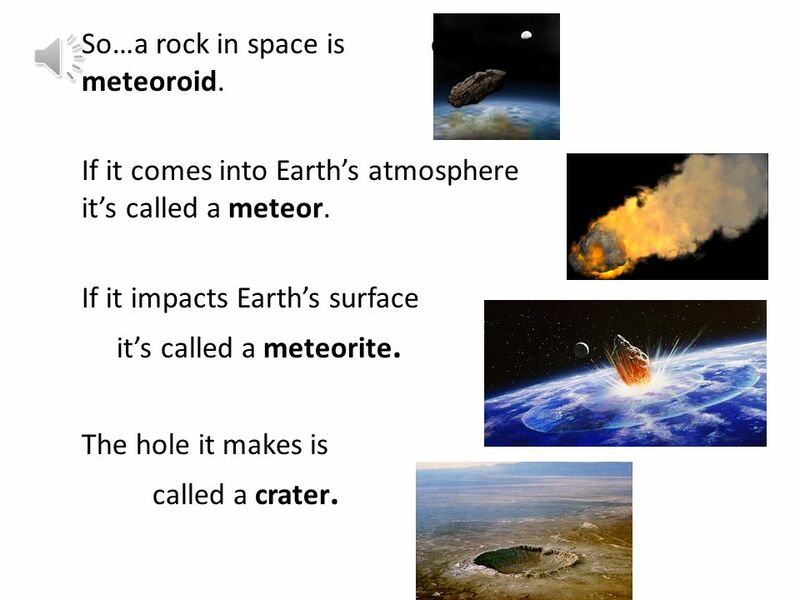 If it impacts Earth’s surface it’s called a meteorite. The hole it makes is called a crater. 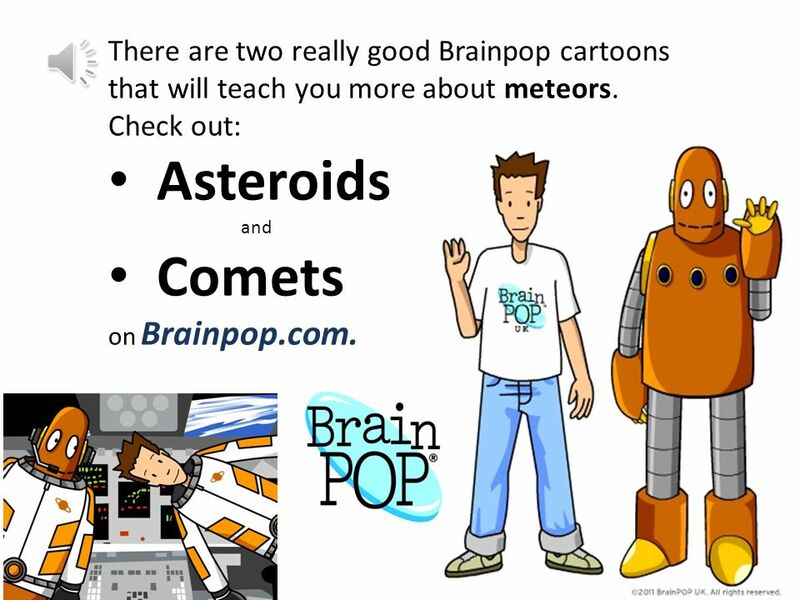 24 J j There are two really good Brainpop cartoons that will teach you more about meteors. Check out: Asteroids and Comets on Brainpop.com. 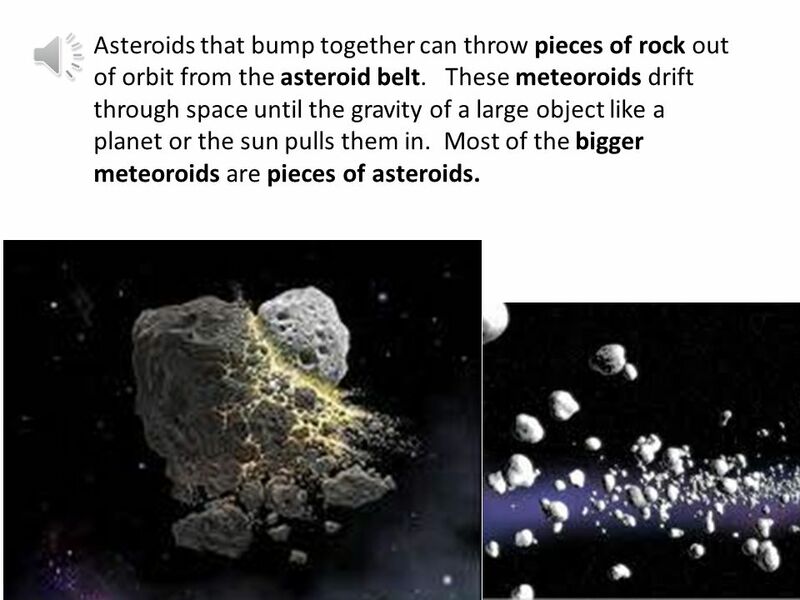 Download ppt "J Meteoroids, Meteors and Meteorites Mr. Harper’s science Mini lesson with audio Click on the speaker icon to hear the words." J Our Solar System Mr. Harpers science Mini lesson with audio Click on the speaker icon to hear the words. Our Solar System Jonathan Hodge Tanglewood Nature Center Photos courtesy of NASA. Notes 14-5 Comets, Asteroids, Meteors. Comets Loose collection of ice, dust, and small rocky particles whose orbits are usually very long, narrow ellipses. What’s That Up In The Sky??? Unit 2 Lesson 1 What Objects Are Part of the Solar System? Copyright © Houghton Mifflin Harcourt Publishing Company. Other Objects in the Solar System (13.15). Planetary Moons Large natural objects that revolve around planets are called satellites or moons. Moons range.